Today Kishonti have finally released their final update to GFXBench version 5.0. The update introduces the new Aztec Ruins scene in two complexity modes as well as OpenGL, Vulkan, and Metal. The company had first announced the new benchmark in 2016 at GDC, and we had largely expected it to come out in 2017. Polishing the new benchmark to run in an orderly fashion in new low-level APIs such as Vulkan, Metal and DirectX12 is undoubtedly a very large task that takes time. The new version runs on a new in-house rendering engine and introduces two new tests: Aztec Ruins (High Tier) and Aztec Ruins (Normal Tier). 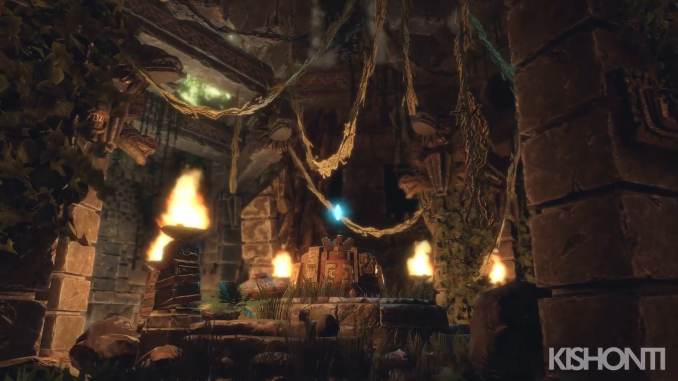 The scene is very much reminiscent of Tomb Raider, showcasing a jungle ruin environment, with an action-adventure like scene. The new benchmark on Android includes the option to run it either in Vulkan, or OpenGL mode, which adds to our current set of dual-API benchmarks which include UL’s 3DMark Sling Shot and Basemark’s Basemark GPU test. This is of particular interest because it serves as a tool which can showcase GPU vendor’s driver quality, in particular how the new Vulkan implementation performs to the more polished and optimised OpenGL drivers. I’m planning to include Aztec Ruins into our mobile benchmarking suite, and here it’s good to give a bit more of an explanation of what the new test brings and how it differs from past tests. I’ve profiled the new tests through Arm’s performance profiler on a Samsung Galaxy S9 running an Exynos 9810 with a Mali G72MP18 GPU. The reason here is simply that Arm’s profiler is one of the more complete software tools at hand that discloses more detailed information about 3D workloads on the GPU. 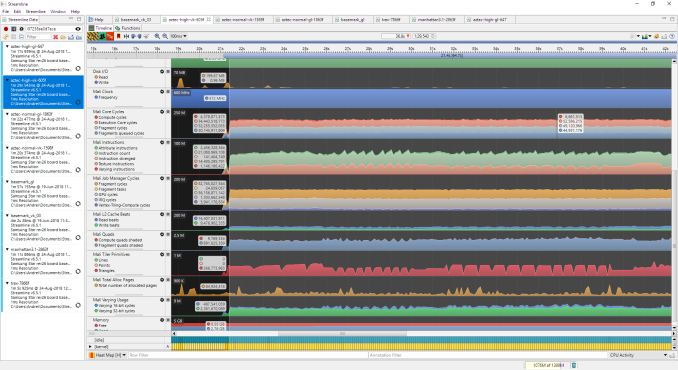 The analysis could have been completed with a Snapdragon Profiler or any other vendor’s tools. As a note, because the data was collected on a Mali GPU, some characteristics will be GPU-specific, such as the bandwidth figures, as these will vary across GPU and SoC architectures. Starting off with Aztec Ruins in its “normal” mode, we largely see an evolution from the Manhattan 3.1 workload. Here the benchmark runs at a default 1080p, and we’re testing in off-screen mode in order to assure apples-to-apples comparisons across different phones. The geometry complexity in normal mode comes in at an average of 207K triangles per frame, slightly less than Manhattan 3.1. While the geometry complexity is less, Aztec Normal increases the shader load by 38%, shading 127% as much pixels as contained in a full frame. Here the ratio exceeds 100% because we’re seeing shader effects overlap each other. The Aztec “High Tier” mode adds effects and complexity on top of what’s contained in the normal mode. There is generally more detail, such as more foliage, more grass tufts, etc. Textures in this mode increase their resolution from 1K to 2K pixels, something especially notable in the more than doubled memory bandwidth usage per frame. There are more than twice as many global illumination light probes throughout the workload, added particle fire and smoke effects, lightshafts, a higher quality bloom and depth of field effect, and finally more lights are shadow mapped. The end result for the High mode are that it more than doubles the average geometry complexity to up to 440K triangles per frame, and again increases the amount of shader work per pixel by 27%, reaching an average of 161%. In actual numbers, because the High mode runs at a default 1440p, this more than doubles the amount of shader compute power required. When looking at overall benchmark workload complexity over the GFXBench tests over the years, we see an increasing trend of more shader heavy workloads. Here T-Rex’s fragment shader workload is still relatively low at only 31% of the rasterised pixels, but has a quite higher geometry throughput requirement than even still the newest Aztec Ruins in High mode. Here performance is very much fill-rate limited, and is actually still a good representation of a lot of today’s games, as compute-heavier titles becoming more and more common over the years. Overall, the new Aztec tests continue down the road of ever more shader-heavy and compute requiring workloads, something that is being overall reflected in actual game titles in the industry. Testing out the new benchmark on the four current flagship SoCs gives us a better idea of the new performance characteristics the new benchmarks showcases for the various GPU architectures. The iPhone X is powered by the A11 SoC and a customised GPU. The OnePlus 6 offers the Snapdragon 845 and the high-performing Adreno 630, while both the Galaxy S9 and Honor Play use Arm’s Mali G72 GPU, but implemented differently across the Exynos 9810 and Kirin 970. Unfortunately because Apple is deprecating OpenGL, we don’t have an API comparison on the iPhone X. Nevertheless, we’re presented with excellent peak performance by the A11 GPU, although the phone gets noticably hot even after one run. The OnePlus 6 leads the Android pack, increasing the gap between the Adreno 630 and the top-performing Mali GPUs. Here the Adreno’s raw theoretical specs at 727 GFLOPs almost double the 370 GFLOPs of the Exynos 9810’s Mali G72MP18. In ever increasingly computationally heavy workloads, the Adreno is able to showcase this power, while the Malis do better in keeping up in less shader demanding workloads such as T-Rex. 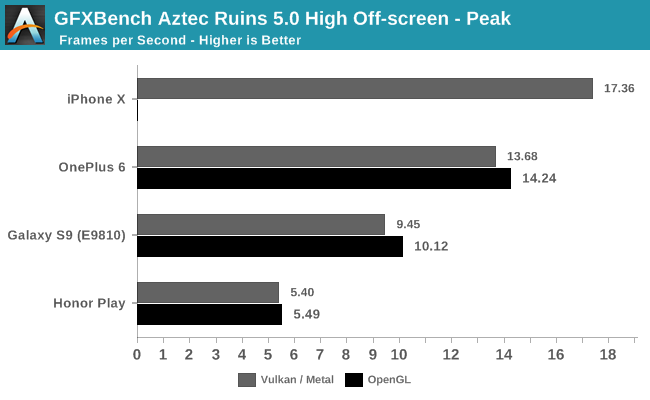 Overall, the new Aztec tests try to predict the industry trend towards more computationally heavy games, while also increasing all other performance requirement knobs. With the current strongest performance GPUs peaking at 10-17fps in the High tier mode, hopefully the benchmark will serve as a steady mainstay in our benchmark suite for a couple of years to come. We’ll be including more results such as sustained performance figures in our future mobile reviews.